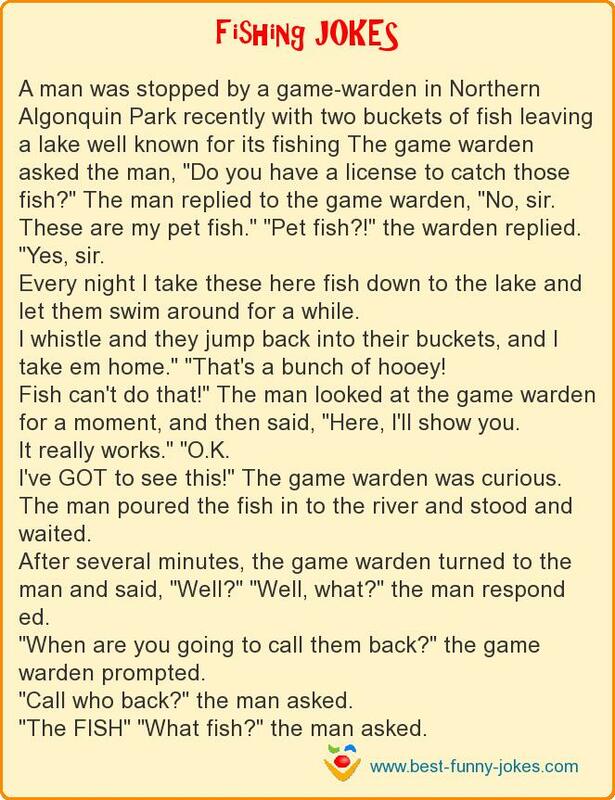 A man was stopped by a game-warden in Northern Algonquin Park recently with two buckets of fish leaving a lake well known for its fishing The game warden asked the man, "Do you have a license to catch those fish?" The man replied to the game warden, "No, sir. These are my pet fish." "Pet fish?!" the warden replied. Every night I take these here fish down to the lake and let them swim around for a while. I whistle and they jump back into their buckets, and I take em home." "That's a bunch of hooey! Fish can't do that!" The man looked at the game warden for a moment, and then said, "Here, I'll show you. I've GOT to see this!" The game warden was curious. The man poured the fish in to the river and stood and waited. After several minutes, the game warden turned to the man and said, "Well?" "Well, what?" the man respond ed. "The FISH" "What fish?" the man asked.